Welcome to our Mini Pitch Wars Workshops with some of our amazing past and 2018 mentors. 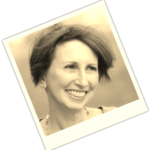 From a lottery drawing, we selected writers to receive a query or first page critique from one of our mentors. Each mentor has graciously critiqued a query or first page from our lucky winners. We’ll be posting some of the critiques leading up to the submission window. Our hope is that these samples will help you all get an idea on how to shine up your query and first page. We appreciate our mentors for giving their time to do the critiques. If you have something encouraging to add, feel free to comment below. Please keep all comments tasteful. Our comments are set to moderate, and we will delete any inappropriate or hurtful ones before approving them. 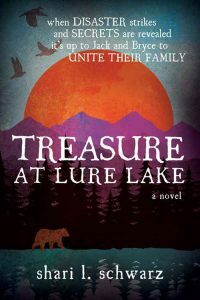 Shari Schwarz is the author of the middle grade, survival adventure novel, TREASURE AT LURE LAKE. She and her husband and their four boys live near the Colorado Rockies where they love to go on their own adventures. 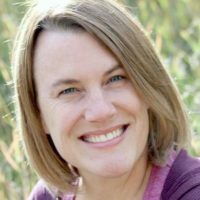 Shari is also a literary intern for Adult manuscripts and is excited to be mentoring Adult this year! I couldn’t believe what I saw: a map of a river next to a house and leading to a lake. Beside the lake was a tree, and beside the tree was an X.
Bryce’s best-laid plans for a backpacking trip with his grandpa seem about to fall through. But when he finds a treasure map in his grandpa’s barn, he just knows it’s going to lead to something good. One thing is certain—no matter what the treasure map leads to, this is going to be the biggest adventure of Bryce’s life! Shari’s First Page Critique . . .
Catherine Reed stared down at the alabaster-colored face of her husband, John. Potentially reword: “Catherine Reed stared down at her husband’s alabaster face. John’s eyelids (one word) were closed…” I’m also not a huge fan of “stared down.” Maybe something like “leaned over” or “bowed over” Just ideas though, this is an intriguing opening! His eyelids were half closed and one corner of his blue lips jutted upward as if he just told something funny and was in the process of laughing at his own joke. He was always making jokes. She had hoped this was another one of his jokes but how could it be with his legs jutting out from his body at strange angles. His usually broad, deep Deep seems like an odd word. I would just delete it. chest looked oddly flat as if he was holding his breath a little too good. “a little too good” feels meh compared to the rest of your lovely writing. The foreman, Wilber Watkins, said there had been an accident. John was a river rat—a man who stood riding logs I’m not sure about the wording or meaning here. He stood on riding logs? He rode logs? Consider rewording or maybe it’s just the vernacular? on the Cumberland River and kept the timber from bottlenecking. He slipped into the river between the logs he was floating down to the sawmill in Crestville add a comma Kentucky. Indent the next paragraph or put up with the previous paragraph. Catherine thought back to that morning and John. He kissed their daughter Clair Offset names off with commas. on the cheek and playfully tugged at the largest, No comma when using colors golden curl at the side of her face. He’d kissed Catherine good-bye too before picking up his lunch tin. If she had known it was the last time she would kiss her husband, she would have made it last longer. Having two “woulds” here feels klunky. Someone was speaking beside her. It was Wilber I would cut this to something like: Beside her, Wilbur was asking… OR just put it in dialogue. asking what she wanted done with the body. The body—what a way to refer to her John. It was all wrong. This wasn’t the way it was supposed to be. She and John were saving for a home of their own to get out of the lumber camp. They wanted somewhere permanent to raise Clair; somewhere where they could plant a garden. I love this last line! I think this is a strong writing sample. I love the flow of your writing! And I am intrigued. What happened to him? What were their hopes and dreams? One thing I would definitely recommend is finding a less generic title. Try to find something that pulls a reader in. Titles, as you know, can be powerful! I hope my comments helped. Take what feels right and toss the rest. 😊 I wish you the very best luck on PW and your writing journey! Thank you, Shari, for your critique! 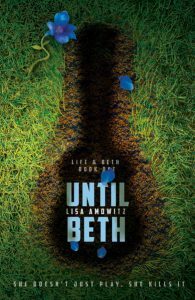 Lisa Amowitz is an award-winning author of three fantasy/thrillers for young adults, Until Beth, Vision, and Breaking Glass. She’s also a cover designer and Professor of Graphic Design at Bronx Community College. Talented rock guitarist Beth Collins has been barely holding herself together for months, ever since her boyfriend and bandmate became the latest victim in a string of suspicious disappearances. When her brother is injured in an accident and she sees something dark billowing around him as he hovers close to death, she’s convinced her sanity is collapsing for good. Then she’s accepted by a boarding school for the musically gifted. All of her new friends are bursting with talent, but they’re also keeping secrets. Can she trust Vincent, who’s so sweet that his very touch makes her fears melt away? Or Xavier, who’s trying to tell her something but is hiding even more? Will anyone be safe when her true Talent comes out? Lisa’s Query Critique . . . This is such an interesting premise. I do think the query is a little wordy and possibly too familiar, so I’m going to work on cutting and trimming a bit. Additionally, the word count of 150K is a red flag—it’s very high, even for fantasy. As I re-read your query, I don’t see anything that identifies this book as YA, as your comp titles are not current YA fantasy. Perhaps, this requires a bit of soul-searching? If it is YA, then you need an mc age and a more current comp title. You can say Lord of the Rings meets—The Darkest Minds—or whatever works. A young boy awakens in the desert with no recollection of a life before, his only friend a voice in his head. I’m seeking representation for BACK TO THE DRAWING BOARD, a 150,000 word YA fantasy tale that explores what happens to the worlds a writer creates and discards, friendship, legacy, and what we’ll do to preserve our fragile existence. After rescue from a vicious attack, NAME (the boy needs a name and age—this is why we don’t know if its YA or MG—YA character age is 15-18, MG age 10-14) and Serena, a fierce young warrior, quickly find themselves thrust into a delete—you use that too often forgotten land where stories are slowly being erased by an unknown entity. In his search for both past and purpose, NAME soon learns there is more to his existence than meets the eye, and that the fate of the world lies, quite literally, within him. With the aid of a ragtag group of discarded characters, NAME begins a journey to the mysterious tower known as the Drawing Board, and along the way discovers both the secret behind the rising darkness, that threatens to overtake the land, his own identity, and the part he must play saving it. Growing up, life often seemed darker than the fantasy worlds I read about. BACK TO THE DRAWING BOARD is inspired by such classics as Lord of the Rings and A Wrinkle in Time, It’s the first in a series chronicling the journeys of the Freethinkers as they fight to bring their stories back to life, as well as exploring the original stories that got them there. Thank you for your time. I look forward to hearing back. Thank you, Lisa, for your critique! Interested in more critiques? We’ll be posting them until the Pitch Wars submission window opens on August 27. Hope you’ll come back and read some more. Hi everyone. How does one get their name thrown in to the hat to be randomly selected? Hey Jason! The critique giveaway was over a week ago. So sorry you missed it!